In Cryptocurrency, Crypto means “Secret” and Currency means “Money”. It means, Cryptocurrency is a secret currency, which is used electronically. It is not a legal tender just like Rupee, Dollar, Yuan, etc. This type of currency is not accepted at shopping counter. Cryptocurrency is created by codes. This is an encrypted string of data and encoded to signify unit of currency. This currency is free from all government sight and monitor by peer to peer protocol. Dubai originated company Pluto Exchange has recently launched an app for trading Cryptocurrency in India. 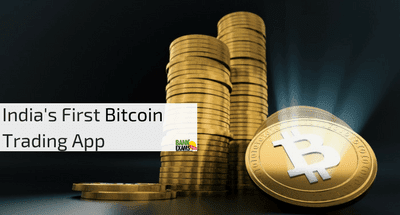 It is a first Bitcoin application in India. This app can start by using 4 digit PIN number, users can buy, store, sell and spend by using a mobile number. As the market has already some applications which can be used by mobile. But this application is different from other application as transactions done by Mobile number to mobile number, but other do the transaction through Bitcoin to Bitcoin address. This app is a first wallet based mobile app enables Bitcoin transaction through the mobile number. First, to find out an authorized exchange as this is not legal and not physically present anywhere so forgery can happen. After that make a secure ID. Buy some Bitcoin by adding legal currency like dollar, rupee, euro, etc. in Bitcoin wallet. Find a seller in Bitcoin exchange after selecting a seller (here, buyer and seller bargain with each other, this is the only reason the price of Bitcoin fluctuate. We can transfer the wallet money to exchange. Seller will also transfer his/her Bitcoin to the exchange. Now, exchange transfer Bitcoin to buyer and wallet money to the seller. The process is done after sending the confirmation to both parties by an exchange. Cryptocurrency is virtual currency and it is stored in digital form in the electronic wallet. Therefore, it is subject to loss arising out of hacking, loss of password, malware attack, etc. Since this currency is not a legal tender or authorized by the central government. Payments are done by electronically, peer to peer basis without any authorized agency (like SEBI, RBI etc) which regulates such payments. As a result, the customer will face many problems like disputes, charges back etc. The value of these currencies is a matter of speculation. Result huge fluctuation in the value of these currencies. Thus, the users revealed potential losses on account of such volatility. Cryptocurrency are being traded on exchange platform whose legal status is unclear. Hence, the traders of digital currency on such platform are exposed to financial risk as well legal risk. RBI also suggests that usages of these digital currencies are largely illegal and illicit activities. Lack of information about dealer/parties could subject the user to breach of anti-money laundering.